I was recently asked the best way to add a Trinnov ST-2 to a TMC-1 system. The TMC-1 penta can be configured to have inserts in the output path which is ideal for for this application. The TMC-1 has a insert key to enable/disable the room correction. The ST-2 has both Analogue and AES I/O, the obvious choice in this case is to use the AES I/O. 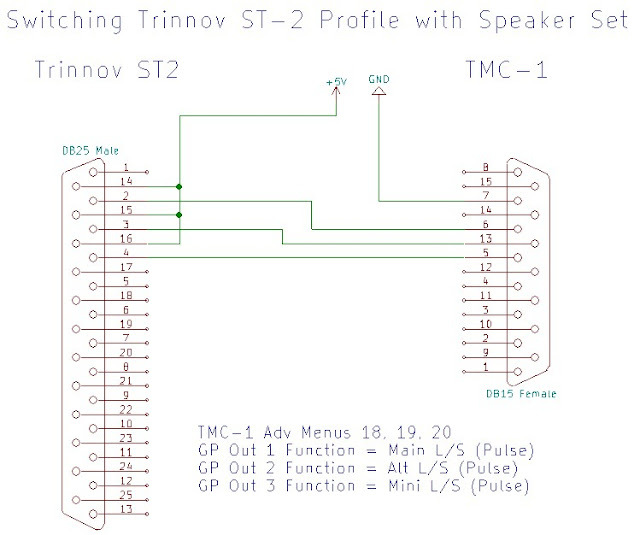 The ST-2 GPIO option provides remote profile selection, to simplify operation we decided to to select the ST-2 profile when the speaker set is selected by the TMC-1. This was achieved by adding speaker set selection to the GP Out 1, 2 and 3 function select in TMC-1 advanced menu's 18, 19 and 20 and connecting GP outputs on the TMC-1 to GP inputs on the ST-2. Power is required for the ST-2 Opto-coupled inputs, the TMC-1 outputs are open collector with a common ground. Although the Penta is the only TMC-1 system with inserts, room equalization may be added after the outputs on the other systems and switched using the same GPIO's.